The Orioles are taking a big picture approach in terms of the development of DL Hall. 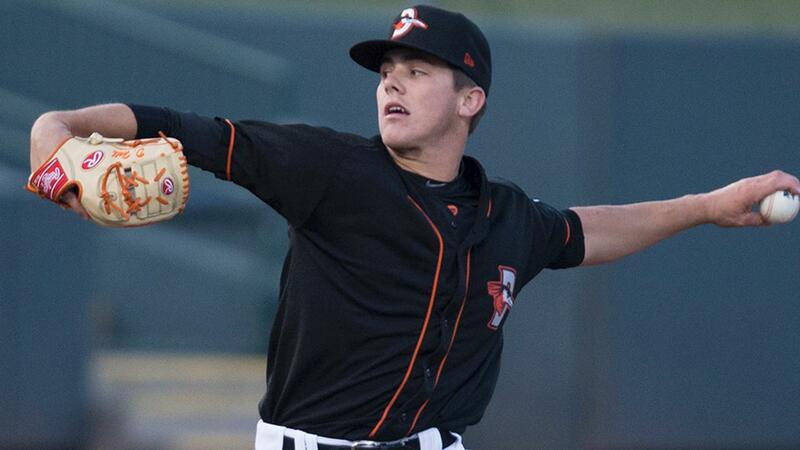 Limited to 10 1/3 innings in five Gulf Coast League appearances last year, Baltimore's fourth-ranked prospect opened this season with Class A Delmarva -- and a strict innings limit. That's why it took the left-hander 11 Minor League starts to finally reach the five-inning plateau, which he did with ease in Sunday's 5-4, 10-inning loss to Columbia at Spirit Communications Park. "I've been wanting to [throw five innings] for a while, so it felt good to be able to get in a rhythm and be able to go more than three innings," said Hall, who was limited to three innings or fewer in four of his six South Atlantic League starts. "It's hard to find your full rhythm when you're only going three innings at a time every six days, so it felt really good to be out there and find it today." Selected 21st overall in last year's Draft, Hall gave up a hit and a walk over five scoreless innings, fanning three. The 19-year-old faced one batter over the minimum, thanks to a pickoff of Edgardo Fermin -- who walked in the first -- and set down the final 12 batters he faced. "I was talking to the guys after my last start and they told me to just throw to [the catcher's] glove instead of throwing away from hitters like I had been doing," Hall said. "So my focus today was just to go at guys and trust my stuff and throw to the glove. I didn't feel great the first two innings, but I just stuck to that plan and settled in after that, and I think it worked out well." The only blemish on Hall's outing came in the second when he allowed a leadoff double to Jeremy Vasquez. But Vasquez never got any closer to scoring as the Georgia native responded with two flyouts and fanned Matt Winaker. "I got behind, 2-0, on that count and then threw a get-me-over pitch and he hit it hard," Hall said of Vasquez. "But after I got out of that inning, my pitching coach [Justin Lord] told me, 'Don't let a leadoff double be the thing that has to get you going. You should be locked in from the get-go.' And that lit a fire under me from there." Hall also thought the 91-degree weather had something to do with the strongest outing of his brief career. "This was the hottest game I've pitched in so far. And growing up in the South, where it was always really hot, and I always played travel ball, I'm used to pitching in these conditions," he said. "So I think that really had a big part, too, in me settling in and staying loose into the later innings. Also, I had my curveball really working for me for the first time since I started pro ball. I got a feel for it in the middle of the game and used it to get some outs late, so that was a big breakthrough for me, too." After throwing 42 of 67 pitches for strikes, Hall turned things over to the bullpen in the sixth. "I definitely wished I could have gone a little longer," he said. "I was still feeling really good when they pulled me, but I know the plan is to stretch me out so I can throw the whole season and still keep me under 100 innings. So I'm probably going to be at three innings again next time and then four and then I guess it depends on pitch count. But that's why I've been mixing up." Lefty Nick Vespi was touched for three runs on three hits and two walks in three innings. The Shorebirds rallied late when Ryan Ripken delivered an RBI single in the eighth and Trevor Craport and Zach Jarrett came through with run-scoring hits in the ninth to force extra innings. Max Hogan put the Shorebirds ahead in the 10th with an RBI single off righty Trey Cobb (2-1), but the Fireflies answered in the bottom of the inning as Jay Jabs singled in the tying run and Hansel Moreno scored on Craport's throwing error at third base. "It was tough to see the end," Hall said. "I'm one of those guys that hates to lose, but we battled and came back and lost on something that was just a crazy baseball play. But our team is really fun to play with and really talented and, I have to say, all of our losses this year were because of something bizarre like that and not because we got flat-out beat. We don't get outplayed."